In just 10 years, from 1996 to 2006, Bogotá’s traffic fatalities dropped by half. Despite facing challenges common to many cities – inadequate infrastructure, congestion, pollution, inequality and crime – the Colombian city has become a powerful example of urban transformation. 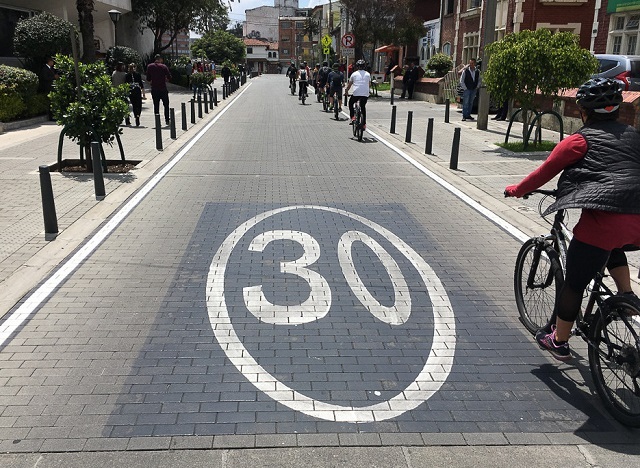 Many elements contributed to this success, including the city’s bus rapid transit (BRT) system, Transmilenio, which debuted in 2000; the creation of an ambitious network of bike lanes; and improved pedestrian sidewalks and crossings. But how did political, financial, institutional and power dynamics contribute? A new research project by WRI Ross Center for Sustainable Cities and the Overseas Development Institute (ODI) has revealed an unforeseen synergy between general public safety actions in Bogotá and efforts to lower traffic mortality. The 1990s were a turbulent decade for Colombia, with record levels of violence and homicide. Citizens demanded a government response. In Bogotá, a suite of enforcement, social marketing and education policies were enacted, under the banner “Life is Sacred.” As part of this program, the administration linked traffic deaths to wider problems of crime and murder in the city, and framed it as a part of a public health crisis. This approach galvanized public attention around “traffic violence.” Targeted social marketing and education programs encouraged people to expect safe and courteous behavior from their fellow citizens and promoted recognition of societal norms in public spaces, particularly traffic regulations. The resulting shift in perspective also generated increased support for changes to public transport and public space. These programs had unexpected benefits for road safety. For example, one “Life is Sacred” policy set earlier closing times for night clubs to reduce alcohol-fueled violence. A welcome side effect was a reduction in drunk driving, which resulted in significant gains for road safety. It demonstrated that Bogotá’s actions to reduce violent crime could have an impact on traffic fatalities as well. Our research also looked at two other cities which struggle with road safety and sustainable mobility options: Mumbai and Nairobi. We examined local political dynamics in all three cities and outlined key challenges and opportunities for catalyzing action to improve road safety. The research did reveal some gains, notably the creation of a non-motorized transportation policy for Nairobi and court-mandated road safety interventions in Mumbai. But we also found that it can be difficult to gain traction politically when discussing road safety in isolation. The issue is often seen as a matter of personal responsibility, rather than a question of public health or government service. In addition to the strategy above, our research identified three more ways to make progress with road safety: tying road safety to other issues, such as traffic congestion; building alliances at all levels of government, including local, regional and national; and producing a dedicated road safety plan with short-, medium- and long-term aims and objectives to build lasting solutions and avoid prioritizing “quick wins” only. These strategies are not failsafe. Even in Bogotá, there is still progress to be made. There, road fatality numbers have plateaued and the new “safe system” based road safety plan hopes to catalyze further action. But its dramatic progress in public perception and political action related to road safety make it a point of reference around the world. The city has shown that a multi-level approach, combining technical know-how with socially and politically savvy campaigns, can unite citizens and decision-makers in a common goal: saving lives. This article was originally published on WRI’s Insights.